Sure is quiet around these parts. I thought you did, too. I was looking all over for it. Doot's playing a trick on us. Nope. It's at the bottom. It just opens in a new window now. Foo's! I've recently acquired a taste for fried eggs (mainly because we have no other food in the house, and I'm too lazy to go shopping). My method is thus: butter the pan; drop the egg; administer salt and pepper; flip; administer more salt and pepper; remove from heat. Over easy to over medium does the trick. Of course, this is all very simple, but I've never really liked eggs. However, these eggs have been turning out savory, buttery, and slightly sweet, and I've enjoyed them immensely. Served with a bit of buttered toast, they really hit the spot. I'm just a latecomer to the egg game, I suppose. Baked beans on toast is a UK staple. In my darker times I took this to new levels. Aromat on tomato ketchup on fried eggs on baked beans on cheese on potato waffles on toast. I've actually tried baked beans on toast. Those canned Heinz beans in tomato sauce are pretty good. But I think you've taken it too far, Doot. Really. 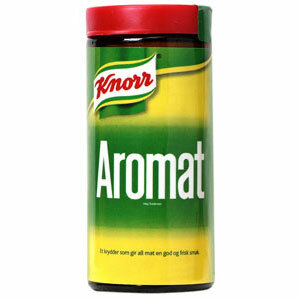 Aromat is the Kondiment of Kings. This is hallowed fact. Pierogies are the best of the best. You eat that tato yet Dee?